Clean dust from brake drum and shoe assembly with a vacuum dust collector to minimize the hazard of air borne particles or other materials. 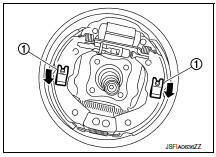 Do not depress the brake pedal while removing the brake drum because the pistons may pop out. Do not spill or splash brake fluid on the brake drum. Drain the brake fluid when removing or disassembling the wheel cylinder is necessary. Refer to BR-17, "Drain and Refill". Remove the brake drum. Refer to BR-42, "Exploded View". Make sure the parking brake lever is fully released prior to removal of the brake drum. The rear wheel hub is housed inside the brake drum. Remove the springs (1) by pushing them inward toward the vehicle and rotating, this will release the shoe hold pins, and the brake shoe assembly (brake shoes, each spring, and adjuster). Do not damage the boot of the wheel cylinder. Disconnect the parking brake cable from operating lever. Do not bend the parking brake lever. Disassemble the brake shoe assembly (brake shoe, each spring, and adjuster). Remove the wheel cylinder with the following procedure. Disconnect the brake tube from the wheel cylinder. Remove the two bolts and the wheel cylinder from back plate. Check the following items and replace if necessary. Check the brake lining for excessive wear, damage, and peeling. Check the brake shoe sliding surface for excessive wear and damage. Check each spring for settling, excessive wear, damage, and rust. Check the adjuster for smoothness, and check it for excessive wear, damage, and rust. Check the back plate for damage, cracks, and deformation. Check the wheel cylinder for cracks, damage, and leakage of brake fluid. Visually check the brake drum for excessive wear, cracks, and damage with a pair of vernier calipers. 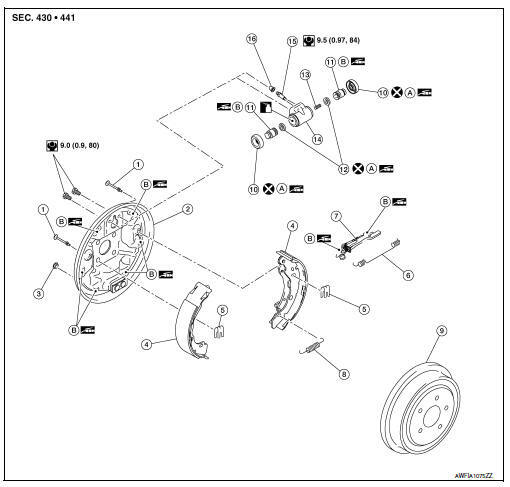 Check the drum brake component parts for excessive wear, damage, and rust. Apply lubrication to the directed areas only. Do not damage the wheel cylinder. Check the difference between left and right wheel of adjuster. Shorten the length of the adjuster by rotating it. Apply PBC (Poly Butyl Cuprysil) grease or silicone-based grease to the mating surfaces between the adjusters and the brake shoes. Apply PBC (Poly Butyl Cuprysil) grease or silicone-based grease to the mating surfaces between the back plates and the brake shoes. Apply PBC (Poly Butyl Cuprysil) grease or silicone-based grease to the pistons. 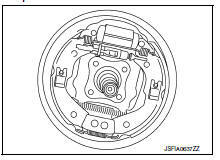 Check the component parts of drum brake assembly are installed properly. Check the brake shoe sliding surface and brake drum inner surface for grease. Make sure that grease does not contact the lining material. Perform the air bleeding when removed or disassembled the wheel cylinder. Refer to BR-17, "Bleeding Brake System". 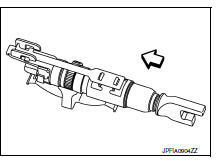 Adjust the brake shoe clearance (parking brake lever stroke) after installation and air bleeding. Refer to BR-13, "BRAKE LINING : Inspection". Check that the component parts of drum brake assembly are installed properly. Rotate the brake drum and check that there is no drag. Perform the following procedure if necessary. Push both sides of the piston simultaneously. Adjust the brake shoe clearance (parking brake lever stroke). Refer to BR-13, "BRAKE LINING : Inspection". Check drag of rear drum brake again. If any drag is found, disassemble the wheel cylinder and replace if necessary. Refer to BR-51, "Disassembly and Assembly". Burnish contact surface between brake lining and brake drum after refinishing or replacing brake lining or brake drum, or if a soft pedal occurs at very low mileage. Refer to BR-20, "Brake Burnishing".